Bibhu Dev Misra focuses on the Mahabharata’s account of the cataclysmic submergence of the fabled Indian city of Dwaraka, tracing it against the Hindu Yuga cycle, and Bronze Age archaeology and geology. The ancient Indian epic, the Mahabharata, relates that the brother-deities Krishna and Balarama had established the city of Dwaraka (Dvaravati) on the west coast of India, towards the close of the Dwapara Yuga (Silver Age) in the Yuga Cycle. The new city was called Dwaraka (or Dvaravati, meaning ‘the city of gates’), presumably because of the large number of gates that guarded the approach to the city. The Mahabharata, as well as the Harivamsa (an appendix to the Mahabharata), contains a number of passages which describe the grandeur of Dwaraka. 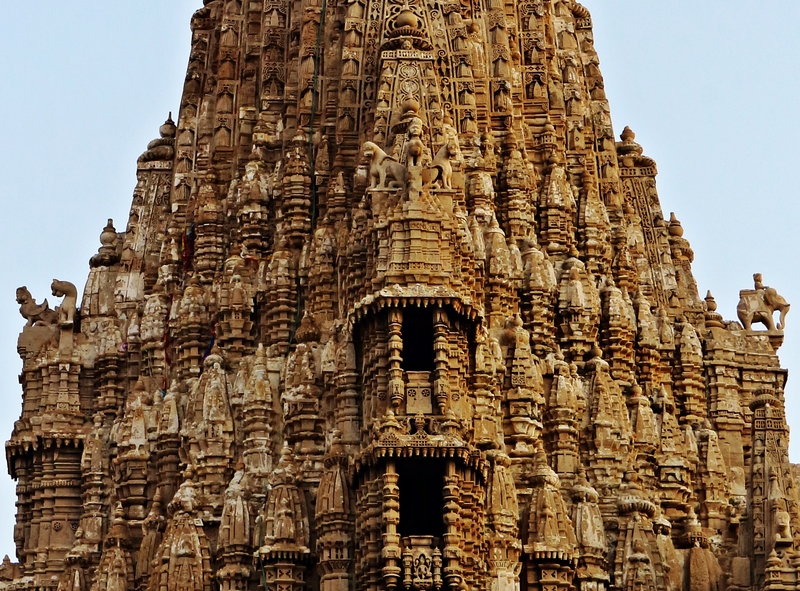 Dwaraka was the capital of the Anarta kingdom, roughly corresponding to the state of northern Gujarat. King Revata, the grandson of Manu, had built a fortress at Kusasthali, which was flooded by the sea, and remained for some time as forest land, before Krishna and the Yadavas went there and built Dwaraka. The Harivamsa says that the sea yielded 12 Yojanas (96 km2) of land for the construction of the city, thereby suggesting that some kind of reclamation work was undertaken. Dwaraka was built by the celestial architect Vishwakarma as a fortified city surrounded by trenches, with four main entrance gates. The city was well-planned, with a large number of pathways, public squares, lakes, gardens, and an assembly of opulent palaces, studded with jewels. There were many tall buildings, reaching up to the sky. The city was known as Suvarana Dwaraka (Golden Dwaraka), as its glittering fort walls and grand palaces were encased in gold. Since Dwaraka was built on the sea coast on reclaimed land, it was also referred to as a Varidurga, ‘fort in water’. On the seventh day, after the residents of Dwaraka had left the city, they looked back and saw the sea swirling through the streets of Dwaraka, submerging the entire city. The sinking of Dwaraka happened exactly the way it had been foretold! Offshore marine explorations near the present-day city of Dwarka (located at the tip of the Kathiawar peninsula) carried out under the leadership of archaeologist S.R. Rao of the National Institute of Oceanography (NIO) have yielded the underwater remains of a Late Harappan port city, dated to c.1500 BCE on the basis of pottery finds and inscriptions. The major features of the submerged city include inner and outer fortification walls with gateways, rectangular enclosures which could have been part of port structures, remnants of a stone jetty, and a number of three-holed triangular stone anchors. Offshore explorations carried out along the eroded shoreline of the nearby island of Bet Dwarka has also revealed the structural remains of a protohistoric port town of about 4 km length and 0.5 km–1 km width, dated to around 1520 BCE on the basis of pottery finds. In both the cases, the size and architectural splendour of the submerged port cities do not correspond to the opulence and grandeur of Dwaraka, as described in the ancient texts. There are no visible remnants of the fort walls and palaces encased in gold, or of sky-touching buildings. Besides, the date of the ruins is much later than the Mahabharata epoch which is traditionally believed to be around 3100 BCE. 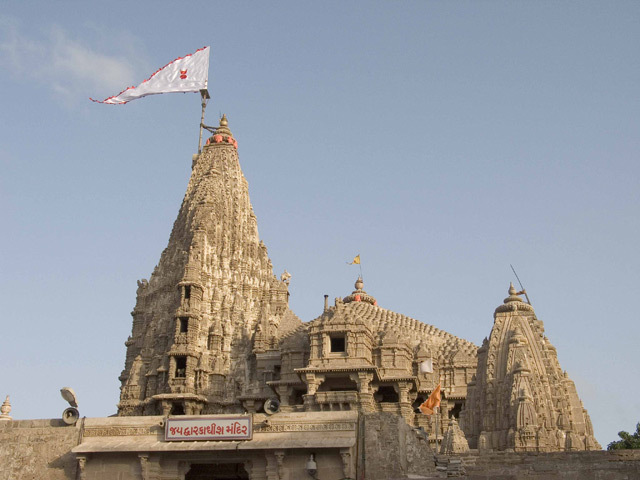 The exact location of Dwaraka, therefore, still remains a mystery. The purpose of the article, however, is not to speculate on the location of Dwaraka, but to determine the nature of the calamity that could have brought about the submergence of the fabled, golden, coastal city. It is interesting that Krishna and Arjuna had foreknowledge of the precise timing of the submergence of Dwaraka. If the sinking had been caused by seismic activity, volcanoes, or landslides, and subsequent tidal waves, there would have been no way to know about it beforehand. However, if it had been brought about by a tsunami, triggered by a deep-sea comet impact, then the calamity could have been foretold. A comet is visible in the sky for many weeks before its arrival, and ancient astronomers could have computed its trajectory and realised that it was on collision course with Earth. This could have given them several days’ notice to make necessary evacuations. What is the Brahma-danda? Prof. Iyengar points out that ‘as per Brihat Samhita and other texts, Brahma-danda was a comet’. The ancient sage Vrddha Garga described the Brahma-danda – an offspring of Brahma – as a ‘three-coloured and three-headed’ comet. Thus, the demise of the Yadavas could have been caused by a powerful comet. Were they struck by the cometary debris, or did the energies of the approaching comet drive them into a warring frenzy? Since we have a detailed account of the Yadavas fighting between themselves, the latter option seems more likely. Krishna, who had witnessed the event, would have seen the danger coming from the skies and immediately understood its grave implications. ‘We can’t rule out the possibility of a tsunami drowning ancient Dwaraka as the town was inundated by some sea activity. There are shlokas which talk of the suddenness of the incident and the gravity of the calamity’. If a tsunami triggered by an oceanic comet impact was the cause of submergence, what would have been its approximate date? Here, I’d like to refer the reader to my article on the Yuga Cycle, ‘The End of the Kali Yuga in 2025: Unraveling the Mysteries of the Yuga Cycle’, in which I propose that the Yuga Cycle was 12,000-years long, split into four 3000-year Yugas, and tracked by ancient astronomers using the Saptarshi Calendar of ancient India, which has a 2,700-year cycle (called a Saptarshi Era or Yuga), and a 300-year period of transition between each Yuga. As explained by Sri Yukteswar, a complete Yuga Cycle takes 24,000 years, and is comprised of an ascending cycle of 12,000 years when the virtuousness of humankind gradually increases, and a descending cycle of 12,000 years, in which the virtuousness of humankind gradually decreases. One of the recorded starting dates of the Saptarshi Calendar is 6676 BCE which, I argue, marks the beginning of the Dwapara Yuga in the descending cycle. Using this as the anchor date, and the Saptarshi Calendar as the basis of computation, the entire Yuga Cycle is unraveled, and points to 2025 as the end of the Kali Yuga. The transitional periods between the Yugas are strongly correlated with the recurrent catastrophes (Sanskrit: pralaya) that impact our planet and bring about a total or near-total collapse of civilisations. In every case, a new phase of civilisation emerges after a period of devastation. The periods of transition are also correlated with a number of important dates recorded in ancient calendars and scriptures. The proposed Yuga Cycle timeline (Fig. 3) indicates that the 300-year period of transition between the Dwapara and Kali Yuga extended from 3976 BCE–3676 BCE. As per the archaeological and geological records, this was a time of great upheaval and changes in the course of human civilisation. In Egypt, the Neolithic Subpluvial, or the Holocene Wet Phase—an extended period of wet and rainy conditions in the climatic history of North Africa—ended in 3900 BCE after the 5.9 kiloyear event. This initiated the most recent desertification of the Sahara; indeed, such aridity has continued to the present day. The Gerzean Culture (Naqada II) which emerged in Upper Egypt in c.3500 BCE laid the foundations of Dynastic Egypt. They started farming along the Nile which produced the vast majority of food, built their cities with mud-bricks instead of reeds, employed pictographic writing on pottery, and established the first tombs in classic Egyptian style. The Ubaid period of Mesopotamia came to an abrupt end in c.3800 BCE, accompanied by catastrophic flooding of the city of Ur near the Persian Gulf. The subsequent transitional period saw the development of proto-Sumerian writing, as indicated by the Kish tablet (c.3500 BCE), and the possible establishment of the proto-Semitic language (c.3750 BCE). In eastern Arabia, the end of the Ubaid period was followed by increased aridity, probably due to the 5.9 kiloyear event; indeed, there is no sign of human presence there for nearly 1,000 years—the so-called ‘Dark Millennium’. In Syria, prehistoric mass graves discovered at Tell Brak, dating from c. 3800 BCE, suggest a period of bloody conflict at that time. By c.3500 BCE in the Indus Valley Pre-Harappan culture had ended in the Indus Valley, and Early Harappan settlements were about to emerge. Archaeologist Henri-Paul Francfort, using images taken by the French SPOT satellite two decades ago, concluded that the Ghaggar-Hakra River (Vedic: Saraswati) began to dry up in c.3800 BCE. The results of Nair and Rao’s isotopic study of groundwater along the palaeochannels of the Saraswati River similarly suggest that the river started drying up at c.4000 BCE. This dovetails with the Mahabharata, which states that Balarama undertook a pilgrimage along the River Saraswati during the Bharata War, and found the river disappearing underground, only to re-emerge at a different place. Evidence suggests, therefore, that it was during this transitional epoch that the Bharata War was fought, and Dwaraka was submerged. Interestingly, research carried out by a group of scientists suggests that fragments of a comet may have struck the Indian Ocean during this period and triggered a cataclysmic mega-tsunami with far-reaching consequences. The Holocene Impact Working Group is comprised of six scientists who hypothesise that oceanic comet impacts during the middle-to-late Holocene were more common than the current scientific consensus suggests, and that these impacts have profoundly affected the Earth’s natural systems, climate and human societies. The scientists, led by Dallas Abbot of Columbia University’s Lamont-Doherty Earth Observatory in Palisades, New York, have identified the 29 km-large Burckle Crater located about 1500 km southeast of Madagascar and 12,500 ft below sea-level. The crater has been dated to 6000 years (c.4000 BCE) and identified as the signature of an impact event that took place in the Indian Ocean. The impact seemingly triggered a mega-tsunami with 200m high waves that created the wedge-shaped chevron dunes found along the coast of southern Madagascar and western Australia. Fig 5: The Fenambosy Chevron near the tip of Southern Madagascar is 600 feet high and three miles from the ocean. © Dallas Abbot. When a comet or asteroid hits the bottom of the sea, it vaporises or melts the material from the rock that it hits, or it itself vaporises, which then condenses and solidifies into sub-microscopic droplets of metal called impact spherules that get embedded within the rocks and deep-sea microfossils at the impact site. Deep-sea core samples collected from the vicinity of the Burckle Crater show the presence of tiny remnants of nickel-rich metal embedded within rocks. Since nickel is not very common on Earth, Abbot thinks these remnants could be vaporised comet or asteroid. As to the sediments from the south Madagascar chevrons—impact ‘ejecta’ is composed of glasses to which are adhered particles of iron, nickel, and chromium, and considered remnant fragments of the meteorite and oceanic mantle. Abbot pointed out that the chevron dunes of Western Australia show similar features. Scientific analysis of the chevrons along the coastlines of western Australia, published in the journal Science of Tsunami Hazards, has revealed that many chevron dunes are not aligned to the prevailing wind directions. Chevrons continue from the coastline to heights of more than 120m, even in rocky environments without sandy sources. The forming forces have been strong enough to reach several kilometres inland, as well as high up on steep slopes. In some regions, at least two generations of Holocene chevrons can be detected. 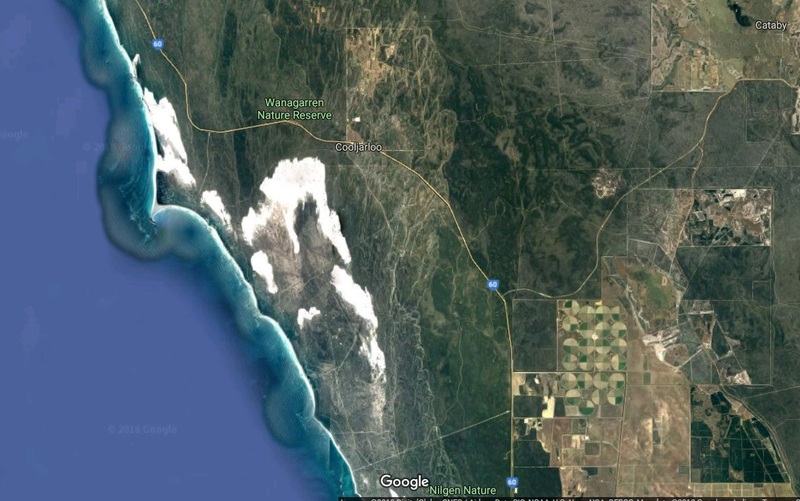 There are indications that the coast of western Australia has been affected by extremely strong tsunamis in the past, which have transported sand, shell and cobble up to 30 km inland, and up 130 m in height, decorating several places along the coastline with large boulder fields. 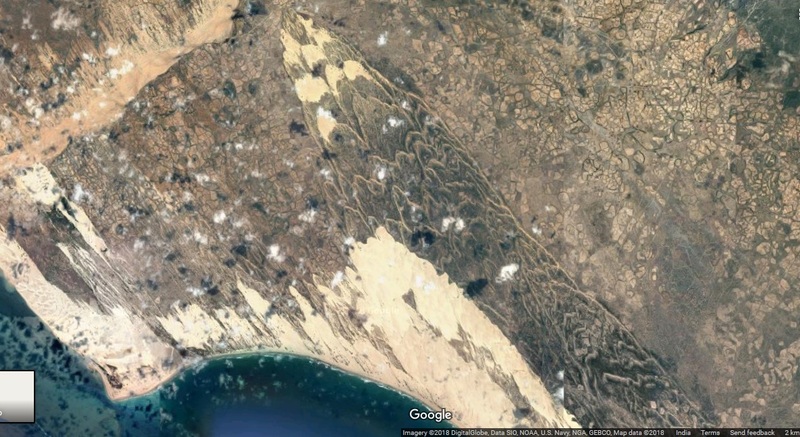 The scientists in the study concluded that, ‘all chevron patterns of Australia can be explained by one or two extreme tsunamis.’ The chevron dunes of western Australia in particular can be explained by a tsunami source near the latitude of Perth. This is the same latitude as that of the Buckle crater (30.8˚ S, 61.3˚ E) which has been identified as the source of the Madagascar chevrons. ‘West Australian coastlines experienced several tsunamis in mid-Holocene times… between Cape Cuvier and Point Quobba, additional tsunami evidence exists on top of steep cliffs over a coastal stretch of 30 km. The sedimentary signature of two tsunamis is documented in this area by wide ridges comprised of sand, shell, and clasts (including coral fragments) at heights of 12–30m asl [above sea level] and 300–500m inland. Enigmatic boulders (20–100 tons) appear as cliff-top megaclasts up to 100m inland. The radiocarbon dating of the Western Australian chevrons gives us a specific, scientifically computed date for the impact event—c.3700 BCE—which falls in the period of transition from the Dwapara Yuga to the Kali Yuga from 3976 BCE to 3676 BCE. This provides a strong basis to postulate that the submergence of the legendary city of Dwaraka was caused by the same impact event, for the tsunami also reached the coast of India. In fact, the sinking of Dwaraka may have been due to a combination of events. Apart from the tsunami waves, which brought about the initial destruction and submergence of the city, the comet impact could have sent shock waves across the ocean floor, triggering a land subsidence. Since Dwaraka was built on land reclaimed from the sea, it must have been susceptible to subsidence. The tsunami waves could have also traveled up the Persian Gulf and brought about the catastrophic flooding of the Mesopotamian city of Ur, at the end of the Ubaid Period in c.3800 BCE. Ur was a major port on the Persian Gulf, which extended much further inland than it does today. In 1929, when Sir Leonard Woolley carried out excavations there, he found an 8 ft layer of flood deposits sandwiched between the remains of the prehistoric Ubaid period, and a layer of debris from the early Protoliterate period. However, flood stratums of the same period were not found in contemporaneous Mesopotamian cities like Kish and Shuruppak. 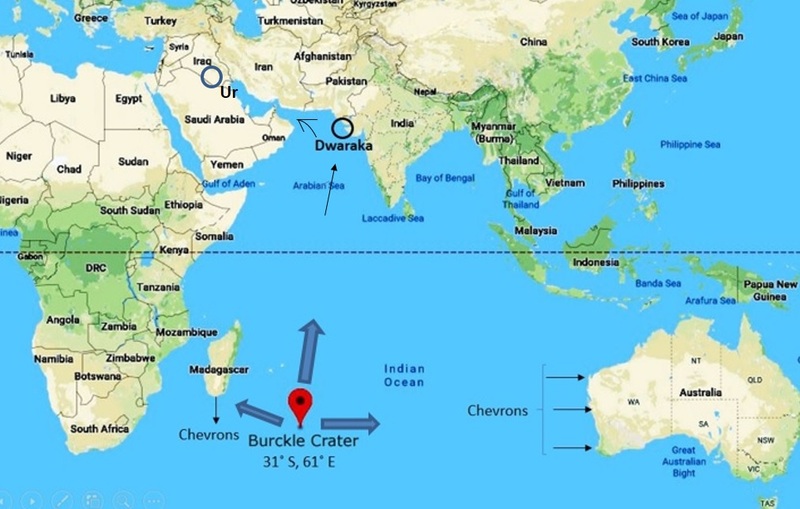 This suggests that the flood primarily affected the coastal city of Ur, and it is possible that the culprit was the Indian Ocean mega-tsunami triggered by the Burckle Impact Crater. Three oceanic impacts from the same fragmented comet! Surely some fragments of the comet must have crashed into the landmasses of the world. If so, it can explain the 5.9 kiloyear event (3900 BCE) that brought the Holocene Wet Phase to an end and triggered intense aridity in North Africa and East Arabia. 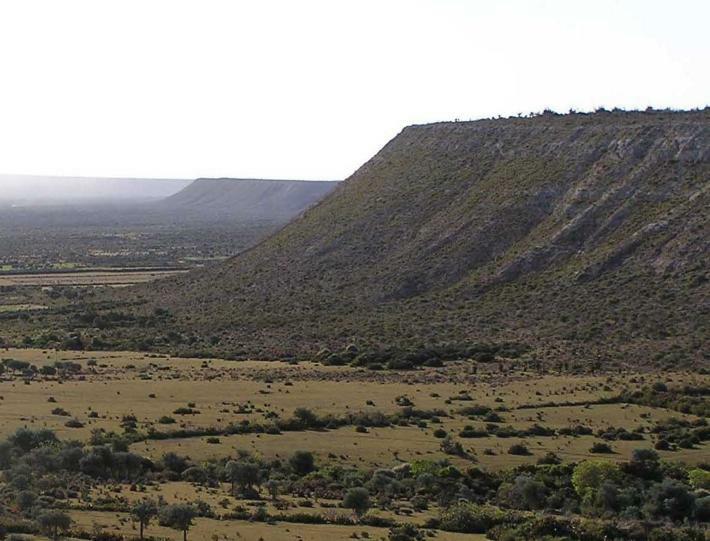 Did some of the objects strike Africa and Asia, converting huge swathes of wet grasslands into dry, barren, deserts? Dust clouds from the land impacts could have blocked out sunlight for weeks, and plumes of superheated water vapour released from the oceanic impacts could have spawned super hurricanes across the globe. The combined environmental disaster may have led to the collapse of the existing civilisations of the period. That could be why we see a new phase of civilisation emerging almost simultaneously at multiple places around the world—on the banks of the Nile, Tigris and the Indus Rivers—at c.3500 BCE. This period of monumental change overlaps with the period of transition from the Dwapara Yuga (Bronze Age) to the Kali Yuga (Iron Age) in the descending Yuga Cycle from 3976 BCE to 3676 BCE, as indicated by the Yuga Cycle timeline. Comets seem to play an important role in the transitional periods between epochs, bringing about an end to civilisations. Many scientists now believe that the Earth was bombarded by multiple fragments of a giant comet in 10,900 BCE. The force of the comet impact, combined with the fire, floods, and the vicious cold snap that followed, brought about the extinction of a large number of North American megafauna and the Clovis Culture. In 9703 BCE, the cold snap ended as abruptly as it had started, for reasons not clearly understood. The sudden transition out of the Ice Age to a warm interglacial climate may have precipitated a global flood of mythic proportions, which is recounted in the flood legends of many ancient cultures. 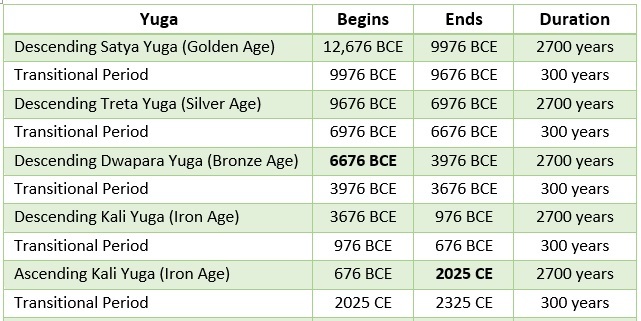 The Yuga Cycle timeline indicates that the end of the Younger Drays epoch in 9703 BE and the subsequent deluge, took place during the period of transition from the Satya Yuga (Golden Age) to the Treta Yuga (Silver Age) from 9976 BCE to 9676 BCE. There is a developing awareness amongst scientists of the threat from asteroids and comets in earth-crossing orbits, along with the realisation that many of the craters at the Earth’s surface, which were previously thought to be of volcanic origin, were in fact formed by impacts. Of the 170 identified impact craters, none are in the oceans, even though oceans cover 70% of the Earth. Benny Peiser, a social anthropologist at the Liverpool John Moores University, believes that each visible crater on land represents more ominous statistical possibilities. ‘For every crater discovered on land, we should expect two oceanic impacts with even worse consequences,’ he stated. It must have been for this reason that ancient cultures regarded comets as ‘harbingers of doom’. During the Middle Ages, comets were looked upon as the ‘portents of impending disaster sent directly from heaven for the warning of mankind’. Tertullian declared that ‘comets portend revolutions of kingdoms, pestilence, war, winds, or heat’ while Conrad Dieterich insisted that, ‘the first comet brought on the deluge of Noah’. The Zoroastrian text, The Bundahishn, states the end of the world will come about when a comet called Gochihr strikes the Earth. It appears from such widespread ancient beliefs, and the evolving scientific understanding of periodic cometary catastrophes, that the cleansing of our planet during the transitional periods between the Yugas are guided by cosmic factors beyond human control. Andrew Dickson White, ‘New Chapters in the Warfare of Science: The Doctrine of Comets’, The Popular Science Monthly, 1885. A.R. Nair, S.V. Navada and S.M.Rao, ‘Isotope study to investigate the origin and age of groundwater along palaeochannels in Jaisalmer and Ganganagar districts of Rajasthan’ (1999) taken from Vedic Saraswati: Evolutionary History of a Lost-River in Northwest India (Geological Society of India). Abbott, D.; Bryant, E.; Gusiakov, V.; Masse, B. ‘Largest natural catastrophes in Holocene and their possible connection with comet-asteroid impacts on the Earth‘ March 2010. 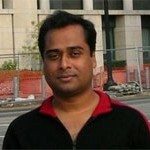 Bibhu Dev Misra, ‘The end of the Kali Yuga in 2025: Unraveling the mysteries of the Yuga Cycle’, July 15, 2012. B. U. Nayak and S.R. Rao, ‘Existance And Location Of Dvaraka City Of Mahabharata Era And Its Subsequent Submergence – A Reality Or A Myth?’, New Trends in Indian Archaeology, VII.10, 1992. Bruce Masse, speaking in the History Channel programme ‘Could a Comet be the Cause of the Great Flood?’. The Bundahishn, Translated by E. W. West, from Sacred Books of the East, Volume 5 (Oxford University Press, 1897), Ch. 30. Charles Q. Choi, ‘Monster Tsunami May Have Created Madagascar’s Giant Sand Dunes’, January 13, 2016. Dallas Helen Abbott, W. Bruce Masse, Lloyd D. Burckle, Dee Lewis Breger, Perri Gerard-Little, ‘Burckle abyssal impact crater: Did this impact produce a global deluge?’, Columbia University Academic Commons (2005). Dale Abbot, speaking in the History Channel programme, ‘Could a Comet be the Cause of the Great Flood?’. Danish Arctic Research Dates Ice Age, Politiken.dk (11 Dec 2008). David MacDonald, ‘The Flood: Mesopotamian Archaeological Evidence’, Creation Evolution Journal, Issue 23 (Spring 1988). Dee Breger, Drexel University’s Director of Microscopy, speaking in the History Channel programme, ‘Could a Comet be the Cause of the Great Flood?’. D. H. Abbott, ‘Impact Craters as Sources of Megatsunami Generated Chevron Dunes’. In 2006 GSA Philadelphia Annual Meeting (October 2006). Dieter Kelletat, Anja Scheffers, ‘Chevron-shaped accumulations along the coastlines of Australia as potential tsunami evidences?’ Science of Tsunami Hazards, Volume 21, Number 3 (2003). European Space Agency, ‘A History of Comets – Part 1: From harbingers of doom to celestial wanderers’. Firestone RB, West A, Kennett JP; et al. ‘Evidence for an extraterrestrial impact 12,900 years ago that contributed to the megafaunal extinctions and the Younger Dryas cooling’. Proc. Natl. Acad. Sci. U.S.A. 104 (41): 16016–21. (October 2007). James Owen, ‘Syria Mass Graves Suggest Ancient Urban Conflict’, National Geographic News, September 7, 2007. Mahabharata, Mausala Parva, Book 16, Section 6′; Book 16, Section 7. Mahabharata, Sabha Parva, Book 2, Section 14. The Mahabharata, The Bhandarkar Institute of Oriental Research (BORI) Critical Edition (CE), Adi Parva, verse 10022205. Michael Casey, ‘Scientists Debate Evidence of Ancient Megatsunami’, National Geographic December 22, 2015. Prashant Rupera, ‘History has it. Dwarka inundated by tsunami!’ TNN, Jan 4, 2005. R. N. Iyengar, ‘Comets and the First Flood as per Parāshara’, Geological Society of India, V. 67, March 2006. R. N. Iyengar, ‘Comets of Ancient India, starting with the Floods, as per Parāśara’. Robert Roy Britt, ‘Comets, Meteors & Myth: New Evidence for Toppled Civilisations and Biblical Tales’, Space.com (13 November 2001). Scheffers, S. R., Scheffers, A., Kelletat, D. & Bryant, E. A. (2008). The Holocene paleo-tsunami history of West Australia. Earth and Planetary Science Letters, 270 (1-2), 137-146. Scott Carney, ‘Did a Comet Cause the Great Flood?’, Discover Magazine, November 15, 2007. S.P. Gupta, ‘The Indus-Saraswati Civilization’, Pratibha Prakashan, Delhi, 1996. Steven M. Goodman, William L. Jungers, ‘Extinct Madagascar: Picturing the Island’s Past’ (University of Chicago Press, 2014). Trevor Palmer, Robert N. Brandon, Perilous Planet Earth: Catastrophes and Catastrophism Through the Ages (Cambridge University Press, 2003) 338-39. University of Kansas, ‘Kansas scientists probe mysterious possible comet strikes on Earth’, December 14, 2009, Phys.org. Vettam Mani, Puranic Encyclopaedia, 9th reprint Delhi 2010. The Yuga cycles you propose are in contrast with the original text but fit snugly into Graham Hancock’s theory, hence why I guess you are being promoted on this website. Also, your Yuga cycles are too perfectly rounded and fit with the precession of the equinoxes, give or take some years. However, the description of the Vanaras would fit the original Yuga time cycles if we viewed them as extinct species of human ancestors or other lineages. It would also give credence to the descriptions of the Vanaras in the Ramayana, that being the transalation which is “forest human”. Your Yuga cycles contradict the rest of the descriptionsin the Ramayana therefore the original Yuga age cycles are likely to be accurate. Nice article though, as was the first one. Thanks for your response. Regarding the “vanaras” in the Ramayana, they are described as human-animal hybrids. They have both human characterestics as well as monkey features such as a long tail, hairy bodies, capability to jump long distances etc. Hanuman, who was a vanara, had godly powers of magic and shape shifting as well. They may have been a humanoid species formed by the mating of the Gods with animals, for in the Ramayana we find Brahma commanding the other deities to father vanara offsprings. If you read Yvonne Whiteman’s interesting article on this forum “PART 1: The Kolbrin On The Sons Of God and Daughters Of Men” (https://grahamhancock.com/whitemany7/) she points that that in the Kolbrin there is a mention of the Sons of God mating with the Yoslings (humans who resembled the beasts), as well as the Children of Men mating with the beasts of the forests to produce hybrid creatures. Such human-animal hybrids are depicted on Sumerian seals as well, indicating that such creatures existed in the Holocene epoch itself, but have slowly died out. This is aligned with my Yuga Cycle hypothesis. Dwaraka: The Golden City of Krishna. 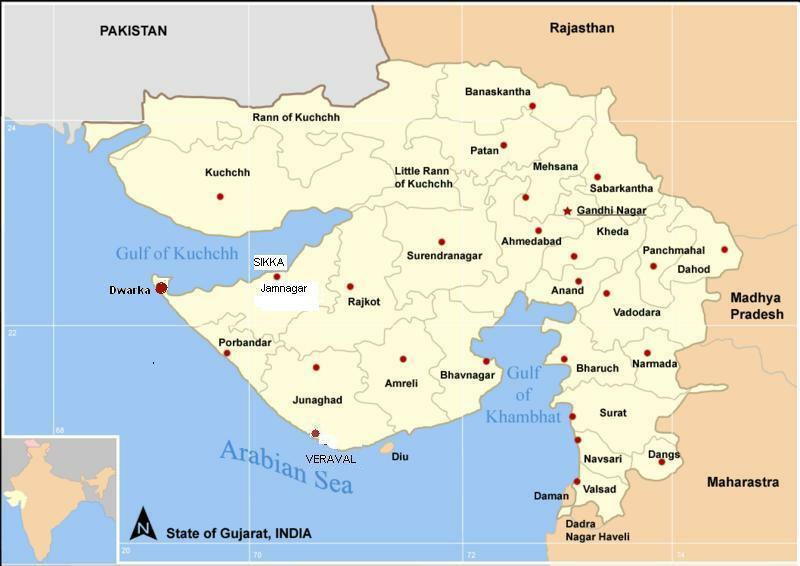 Dwaraka was the capital of the Anarta kingdom, roughly corresponding to the state of northern Gujarat. A fine study. The 3,900bce timeline for burckle crater impact seems to correspond well with climate-change data plus palaeochannels data on disappearence of sarasvati river,start of desertification of thaar and sahara etc global regions. The burckle hypothesis for a 3-fragment cometary impact corresponds well ith the ‘brahma-danda’type of 3-headed comets in rishi paraashara literature. With respect to the 24,000yr and 4-yuga- cycles of sri yukteswar,his framework in “the holy science”is based on the “manu samhita”belonging to a golden age/satya yuga period. The idea of shri bibhu dev mishra,to propose instead 4 equal yugas of 3,000yrs each in both ascending&descending phases of the cycle, needs more rigorous proof from independent disciplines. The mayan civilizational astronomy(probably based originally in the ‘soorya siddhaanta’ of mahamuni maya asura/daanava)also has a system of 5 equal phases of 5,000yrs each and with characteristic catastrophic pralaya events at the end of each. The timeline of 6,676 bce as also reflected in greek historical accounts,corresponds to a yuga-change from satya to treta @6,700+400/-300 bce in the sri yukteswar model. Thank you for your response. I am hoping that more scientists will take the Burckle Crater impact theory seriously, and find out its linkages with the global climate changes between 4000 – 3700 BCE, that led to the emergence of a new phase of civilization across the globe starting from around 3600 BCE.